The National Guard Armory on 9th Street South in Amory was planned around 1937 as part of the Works Project Administration (WPA). 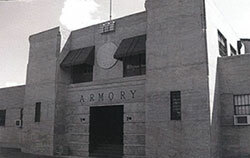 The armory was completed by 1942. It was one of four similar armories designed by Jackson, MS architect N.W. Overstreet and built around the same time in Aberdeen, Starkville, and Meadville. Amory’s was built to replace the first armory, located on North Main St. In the pre-skyscraper age, the local armories were usually one of the largest buildings in town. The Guard needed secure storage space for weapons and equipment, and big enough to train 600 to 1,000 National Guard soldiers. The housing of the soldiers moved to a new armory several years ago. The front of the vacated armory housed the justice court until 1999 when it left for new office space. In recent years, the building is used as a polling place for elections. The old armory’s biggest claim to fame perhaps was being the venue for a Johnny Cash, Carl Perkins, and Elvis Presley concert in 1955 in which a young Elvis Presley was said to have heard the song “Blue Suede Shoes” sung for the first time by Carl Perkins who headlined the musical lineup that night. In 2002 the building, which is situated in the city’s designated Historic District, was named a Mississippi Landmark. The facility has tables (both round and rectangle) available for use when renting. Questions about reserving this historic building for weddings and events may be answered by calling The City Clerk’s Office at 662-256-5721 (option 3). You may also schedule a tour of this historic and newly renovated facility by call Amory Parks and Recreation and speaking with Rory Thornton at 662-256-3221.